There are many different types of body piercings that are available for modifying your image; if you're looking to do something different, yet not too visible, an industrial piercing may be for you. When many people hear the term "industrial piercing", they become a bit confused. This is probably because most piercings are named after the part of the body that they pass through, and everyone knows humans aren't born with an industrial. In fact, an industrial is a piercing that passes through two holes made in the body. Typically, this type of modification is done through the upper cartilage of your ear. It is comprised of two holes, one on each side of the upper ear, with a long (2.5 to 3 inch) barbell slid between the holes. This gives the appearance of a large bar going through the ear, and there are usually sizable balls screwed on the ends of the barbell. When getting an industrial done on your ear, there are several things that come into play. First, the piercer must mark where the barbell will go on your ear. In most instances, the gauge of this barbell will be between 12 and 14; is a thicker size than a typical earring. One of the holes will be made at the top of the ear close to the head (what is also known as an anti-helix piercing) and one will be made through the helix as well. The piercer must take care to line these holes up so that your barbell will go straight through. Your ear will be marked and sterilized, and a sterile needle (or two, depending on the piercer's technique) will be inserted through the skin and cartilage. 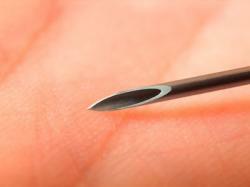 This piercing is often painful due to the large gauge of the needle, and it may bleed. Your piercer will make sure that the needle or needles have gone through the flesh, and then he or she will insert your industrial jewelry. You will receive cleaning and care instructions (Some shops prefer to use Bacitracin, others prefer a product like H2Ocean spray). The industrial piercing usually has a specific piece of jewelry used to set off the unique look. A long barbell (the piercer will measure your ear to make sure he or she gets the right length) will be inserted between the helix and anti-helix holes. There are a growing number of piercers, however, that feel it's better to put a captive bead ring CBR in each of the holes and let that heal before placing the industrial jewelry. That way, it's easier to clean and handle the holes of the piercing (an industrial with a barbell can be tricky to keep clean) and you will have less complications. Most of the barbells used for this piercing are made of surgical stainless steel, and therefore do not come in a variety of colors of styles. Many people do not take issue with this because the industrial piercing is unique enough on its own. 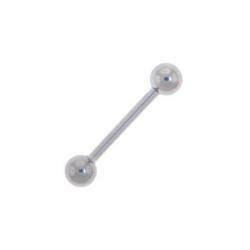 There are some titanium and niobium barbells available, but these are not recommended for fresh piercings. An industrial piercing is certain to attract more interest than a traditional lobe piercing. Just be sure that your piercing professional is very experienced in creating this style of piercing so it's sure to look great on you.